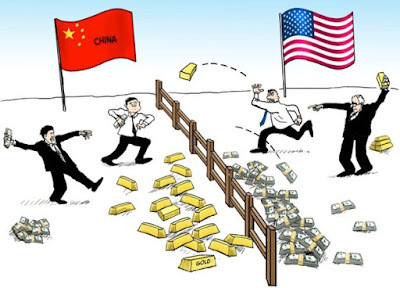 On July 10 the London Metals Exchange, a Hong Kong based corporation, threw down the gauntlet and is entering into the futures contract arena for both gold and silver. In a return to the futures market for the first time in three decades, the LME is preparing to take on the LBMA and its Gold and Silver price Fixing mechanisms, as well as the Comex out of New York, in waging a war over control over the pricing of precious metals. The world’s biggest industrial metals exchange is taking on the most powerful players in the gold market with the launch on Monday of its first futures contract for the commodity since the middle of the 1980s. The London Metal Exchange and its partners aim to grab a piece of the action in a city where almost half the world’s gold changes hands. At stake are rival visions of how best to run the market, pitching the LME, Goldman Sachs Group Inc. and Morgan Stanley on one side and the London Bullion Market Association representing some of the biggest trading firms on the other. Three years in the making, the gold contract, launched alongside another for silver, aims to draw investors from the off-exchange deals that currently dominate the city’s $5 trillion-a-year market. The LME, World Gold Council -- representing miners -- and partner banks hope to capitalize on regulators’ push for more scrutiny by allowing investors to trade contracts on an exchange where transactions are tracked and risks managed. Their LMEprecious venture including Goldman, Morgan Stanley, Natixis SA, ICBC Standard Bank Plc, Societe Generale SA and OSTC Ltd. will centrally clear daily, monthly and quarterly futures contracts using LME Clear.